Dock Square, the PE firm chaired by 2016 presidential candidate Jeb Bush, takes a minority stake in a car warranty insurance company. The firm is also an investor in Vertical Bridge Holdings. "We have been greatly impressed by PMC's service quality, operational acumen, and customer-focused innovation," Bush said in a statement. In a separate deal, Dock Square Capital was one of several investors backing Vertical Bridge Holdings LLC, the largest private owner and operator of communications infrastructure in the U.S., which sold a 30% stake to Caisse de dépôt et placement du Québec (CDPQ), for an undisclosed sum. Bush joined the board of Vertical Bridge in 2017. In the first deal, Bush, who is managing partner and chairman of Dock Square Capital, will join Protect My Car as a member of its board of directors. No investment bank was used on the transaction, according to a source. St. Petersburg, Fla.-based Protect My Car (PMC) provides extended warranty products for vehicles. "Dock Square will add tremendous value as we accelerate our growth plans through strategic partnerships," Craig Rubino, CEO of Protect My Car, said in a statement. Officially launched in January 2017, Coral Cables, Fla.-based Dock Square Capital came out of a predecessor business, Britton Hill Partners, which was co-founded by Bush in 2008, according to a source. Dock Square makes principal investments "which are often originated through our unique network," the firm said on its website. The Deal lists one Britton Hill deal. In 2018, Britton Hill Partners sold Hawker Pacific Pty. Ltd. to General Dynamics for $250 million. 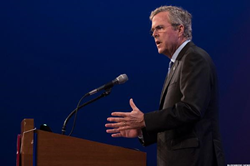 Bush's son, Jeb Bush Jr., works as a founding managing partner of Dock Square Capital. He was a former partner at Britton Hill. Crestview Partners announced its investment in Protect My Car in September as an acquisition from a private investor group, which was not named. In the Caisse de dépôt et placement du Québec deal, the Canadian pension fund joined a bevy of investors in Vertical Bridge Holdings, including Digital Bridge Holdings LLC, Jordan Co., Goldman Sachs Infrastructure Partners, Stonepeak Infrastructure Partners, Edgewater Funds, California State Teachers' Retirement System and Dock Square. Please visit https://protectmycar.com or http://www.docksquarecapital.com for more information.